was the first, the best, the one who set the bar for all Aussies who came after him. I got an Aussie as I wanted an atheletic and protective dog. He was quite a dog, high drive, intelligent and loved to work. When I visited my parents with my busy baby puppy, they asked how I would keep him entertained. I read a book about Aussie which said they were herding dogs. So I decided to find somewhere to go herding. And met one of the best and nicest people (Jim Geurin) who helped me get started in the journey of working with stock dogs and livestock. Then I heard about agility. 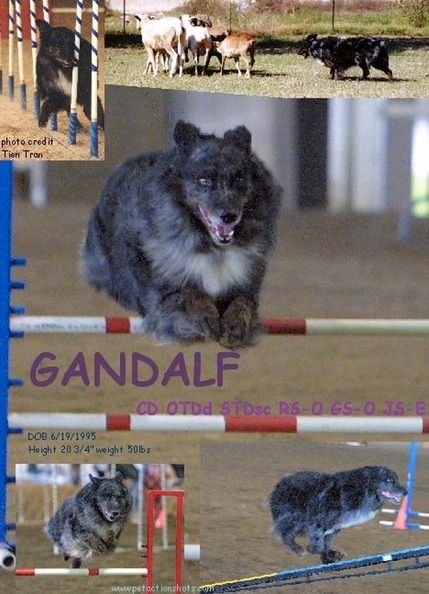 As Gandalf would happily climb ladders, etc after me I decided that agility would also be fun. We also tried Search and Rescue, Gandalf loved finding his "victim" as he wanted that toy and game of tug. I will be enternally greatful for the wonderful people and activities Gandalf introduced me to.